A BIZZARE UFO has been seen by thousands of people all over the world this month. The “hovering orb” that turns into a bizarre shape-shifting object when filmed has appeared in YouTube videos captured across the world and been reported to various UFO websites, including the US-based Mutual UFO Network (MUFON). One of the latest sightings to be recorded was in Elmbridge, near Gloucester, this month. Rob Wheatman who recorded video footage of it said: “I saw it as a sparkling ‘star’ from the garden in Elmbridge, due south. “What alerted me was an orange light that came from it and travelled at speed north east. 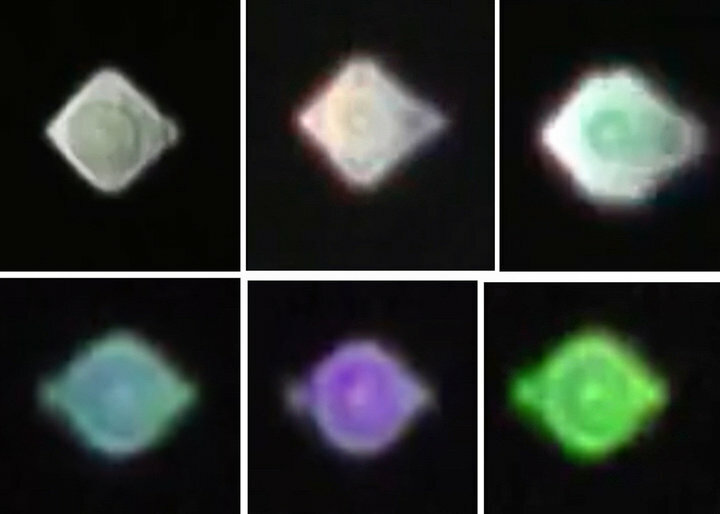 UFO blogger Scott C Waring, who runs website ufosightingsdaily.com, said: “This glowing UFO has been recorded all around the world in the last four weeks. “I can easily post 20 videos of it in different countries. “I myself recorded it just two weeks ago and it looks exactly the same as this here in Taiwan. “I didn’t bother posting it, because lately it seems people on Youtube only want to view fake UFO videos and they ignore the real ones. A planet when filmed under scintillation appears like this on camera, but is often reported as a UFO. But, despite several claims this is a bizarre form of alien craft or even living biological entity appearing all over the internet, Express.co.uk, can reveal it is nothing more than one of the planets in our solar system. All the reports share the common theme that the object is star-like and does not move when viewed with the naked eye. However, it appears to dart about and change shape when viewed through an optical lens. Scott Brando is a UFO hoax buster who runds website ufoofinterest.org. He said the optical effect caused by zooming in on a planet was called scintillation. He said: “People like to share this rubbish to make it viral. “I already said in a tweet, it’s a planet/star under the scintillation effect. “Some people look at the sky without understanding what the planets/stars they are seeing are, and mistake optical effects like twinkling or scintillation for UFOs.